The idea of "use it or lose it" when it comes to our brains in later life has previously been widely accepted. This provides a "higher cognitive point" from which to decline, say the researchers. The work, published in the BMJ, was undertaken by Dr Roger Staff at Aberdeen Royal Infirmary and the University of Aberdeen. The study uses modelling to look at associations and cannot prove any causal link. Also, many of the participants were unable to complete the whole study - some dropped out, others died. Dr Staff and colleagues say even though their study did not find puzzles counteracted mental decline, it doesn't mean they are a waste of time. Dr David Reynolds, chief scientific officer at Alzheimer's Research UK, said the research added to the "ongoing 'use it or lose it' debate". But as the research did not consider people with dementia, "we can't say from these results whether specific brain training activities could impact a person's risk of the condition". "In addition to staying mentally active, keeping physically fit, eating a healthy balanced diet, not smoking, drinking within recommended guidelines and keeping weight, cholesterol and blood pressure in check are all good ways to support a healthy brain as we get older." 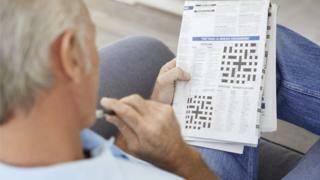 Dr James Pickett, Head of Research at Alzheimer's Society, said: "Although playing 'brain games' such as Sudoku may not prevent dementia, is has been shown that regularly challenging yourself mentally seems to build up the brain's ability to cope with disease." Can you use your brain to 'change your age'?